Product #46743 | SKU MC220L | 0.0 (no ratings yet) Thanks for your rating! The MC220L is a media convertor designed to convert 1000Base-SX/LX/LH fibre to 1000Base-T copper media or vice versa. 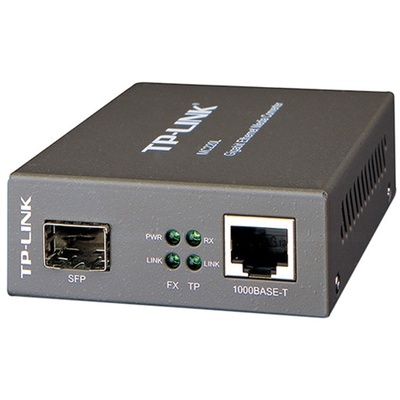 Designed under IEEE802.3ab 1000Base-T and IEEE802.3z 1000Base-SX/LX/LH standards, the MC220L is designed for use with multi-mode/single-mode fibre cable utilising the SC/LC-Type connector. It works at 850nm on both transmitting and receiving data when adopting multi-mode fibre and 1310nm on both transmitting and receiving data when adopting single-mode. Other features of this module include the ability to be used as a standalone device (no chassis required) or with TP-Link's 19"system chassis, Auto MDI/MDI-X for TX port, and front panel status LEDs. The MC220L will transmit at extended fibre optic distances utilising multi-mode fibre up to 0.55 kilometres and 10 kilometres when utilising single-mode fibre.